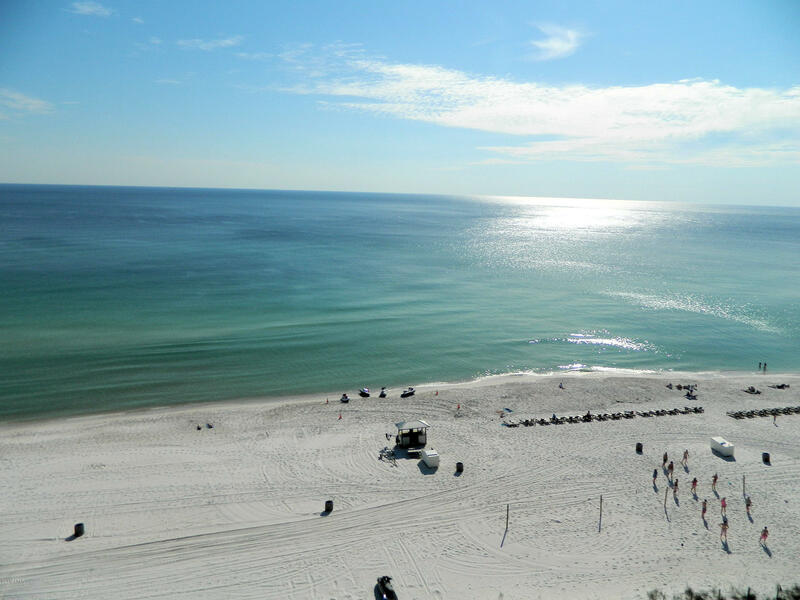 Spacious Condo for sale on the 10th floor right on the beach with covered private balcony. Offered fully furnished, tile throughout, full kitchen, laundry. Rental ready. No long elevator waits, parking is building-side. Tower III has it's own heated pool and hot tub. Just steps from the main amenities. Indulge yourself with tropical pools, hot tubs, sun decks. Poolside Bar & Grille, Pizza Shop, Market. Sports Club offers Unlimited Golf, Pro Shop, Fitness Center, Tennis, Basketball, Shuffleboard. Bella Salon & Spa services available. Kids Club with special events & fun activities! Owner Pets Welcome. 24-hour Security, Gated Entrances. Walkable to shopping, dining, entertainment. On trolley line to popular Pier Park. Ask how rental income can pay your HOA dues and offset ownership expenses!